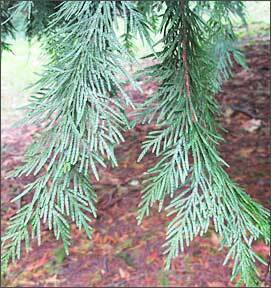 Known to the native Americans as the “tree of life”, the Western red cedar provided them with virtually everything they needed for their lives. Every part of the tree was used. Tools, baskets and fishtraps were made from the ropey branches, the strong fiber of its roots were woven into hats and headgear, and the wood provided for their lodges and was carved into totems, boxes, cradles, masks and instruments. its bark provided clothing, blankets and diapers, while a downed cedar became great canoes with the capacity to carry 20 people. No wonder this tree was revered and well cared for. It became a “cornerstone of Northwest Coastal Indian culture”— so much so that the Native Americans called themselves “People of the Cedar.” It is still held in high regard for its healing and spiritual powers. Many medicines have been created from this tree. Together with the Douglas fir and western hemlock, the western red cedar is one of the most widespread trees in the Pacific Northwest. It’s a beautiful tree with its shaggy bark and graceful branches with tips that swoop upward. 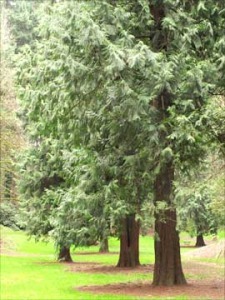 Standing upward to 200 feet with a girth of 10 – 13 feet in diameter, the western red cedar can be a very long lived tree. 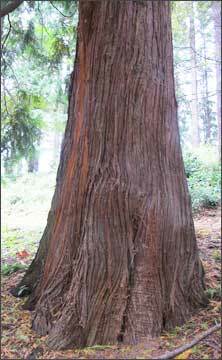 Ring counts of trees from Washington and British Columbia indicate that some trees live at least up to 1460 years. This is a tree worthy of respect and we are fortunate to have so many grace our park.